Product prices and availability are accurate as of 2019-04-21 18:13:30 UTC and are subject to change. Any price and availability information displayed on http://www.amazon.com/ at the time of purchase will apply to the purchase of this product. Author Bookstand is proud to offer By Christmas by Bookstand Publishing. Bookstand Publishing offers books by the best indie authors throughout North America and the world. Bookstand Publishing is dedicated to offering original content to a broad audience and promoting great authors, literacy, and freedom of expression. By Christmas has generated a lot of interest and excitement and we think it would be an excellent addition to your library. When Macy Kellogg is diagnosed with Lung Cancer, she is not sure whether or not she will be alive by Christmas. Her whole world begins to crash down around her. It was her childhood dream to win an Oscar for best original screenplay since she was a child, and now she must come to terms with her broken dreams and her failing writing career. 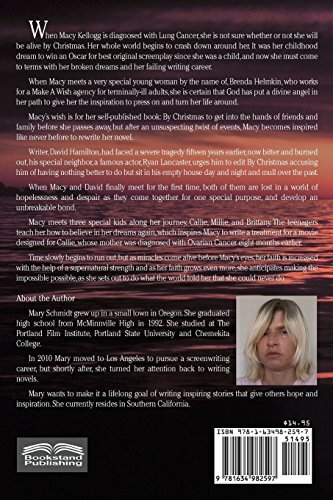 When Macy meets a very special young woman by the name of, Brenda Helmkin, who works for a Make A Wish agency for terminally-ill adults, she is certain that God has put a divine angel in her path to give her the inspiration to press on and turn her life around. Macy's wish is for her self-published book: By Christmas to get into the hands of friends and family before she passes away, but after an unsuspecting twist of events, Macy becomes inspired like never before to rewrite her novel. Writer, David Hamilton, had faced a severe tragedy fifteen years earlier, now bitter and burned out, his special neighbor, a famous actor, Ryan Lancaster, urges him to edit By Christmas accusing him of having nothing better to do but sit in his empty house day and night and mull over the past. When Macy and David finally meet for the first time, both of them are lost in a world of hopelessness and despair as they come together for one special purpose, and develop an unbreakable bond. Macy meets three special kids along her journey, Callie, Millie, and Brittany. The teenagers teach her how to believe in her dreams again, which inspires Macy to write a treatment for a movie designed for Callie, whose mother was diagnosed with Ovarian Cancer eight months earlier. 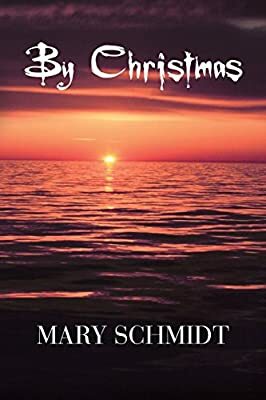 Time slowly begins to run out, but as miracles come alive before Macy's eyes, her faith is increased with the help of a supernatural strength and as her faith grows even more, she anticipates making the impossible possible, as she sets out to do what the world told her that she could never do.